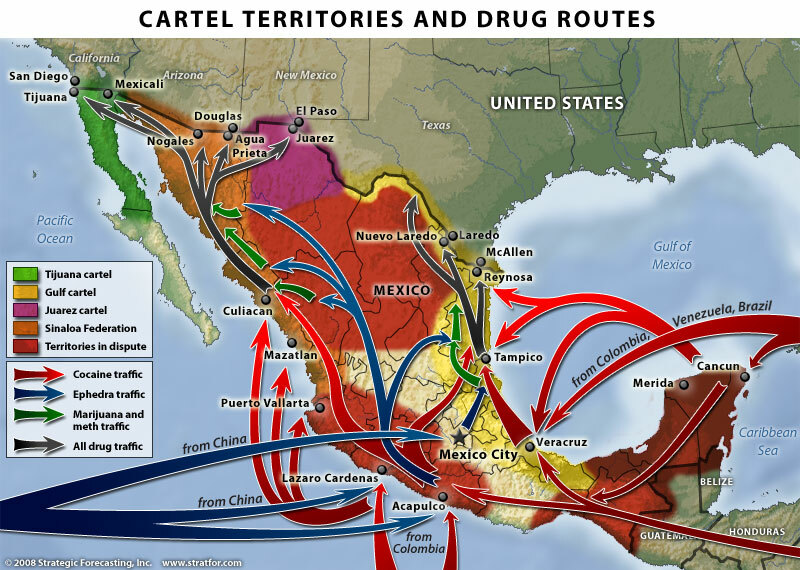 This map of drug cartel territories and drug trafficking and export routes comes from a Stratfor Global Security and Intelligence Report by Fred Burton and Ben West, When the Mexican Drug Trade Hits the Border, published 15 April 2009. Map of Cartel Territories. Copyright Stratfor. Click map for enlarged version. Click here to see map in its original context. Map © Copyright 2008 Strategic Forecasting Inc, STRATFOR www.stratfor.com. This map is republished with permission of STRATFOR. The map shows the major routes for Mexico’s imports, transport and exports of drugs. The boundaries between cartel territories are in a constant state of flux as rival cartels fight to enlarge their territories. Perhaps the single biggest shift in the geography of drug trafficking in Mexico in recent decades has been that involving drugs originating in Colombia. Prior to the 1980s, Colombian drugs reached the US and Canada either direct or via the Caribbean. During the 1980s, as US pressure mounted on these routes, Colombian cartels shifted their supply routes to Mexico, where they needed the help of Mexican gangs. These gangs rapidly became better organized and have become the powerful Mexican cartels operating today. An overview of the geography of drug trafficking in Mexico forms part of chapter 20 of Geo-Mexico: the geography and dynamics of modern Mexico. Buy your copy today!